Get notified when Real Salt Lake tickets are available! Real Salt Lake is a Major League Soccer team that plays in the Western Conference and represents Salt Lake City, Utah. Founded in 2004, the team won their first championship in 2009 and has won a number of other titles and tournaments. 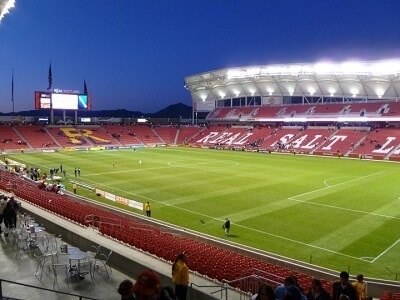 Real Salt Lake plays their home games at the Rio Tinto Stadium, which is located in Sandy, Utah, outside of Salt Lake City. The stadium first opened in 2008 and can seat more than 20,000 people for soccer games. If you would like to see Real Salt Lake play, use the links above to buy Real Salt Lake tickets online.